Our weekly challenge #77 from The Diva is by Rho Densmore CZT. Rho has created a special tangle to honour the life of her late brother-in-law and named it Fiore di Pietro (Peter's flower). 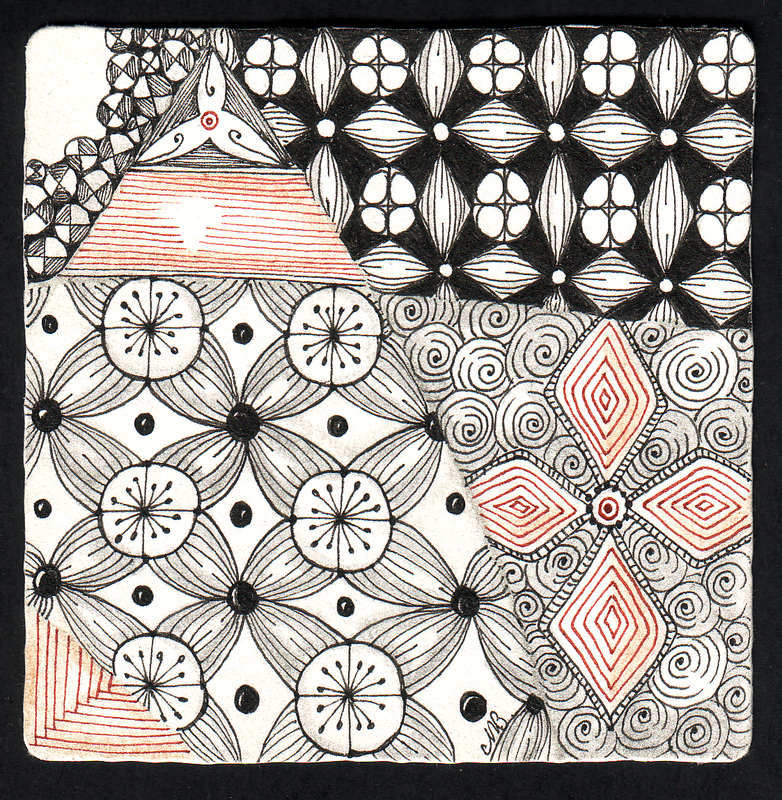 It is a delightful tangle which has many different looks and ways to explore patterns. Rho, I am sorry for your sadness, you have permission to use my tile. Beautiful, as always. I love the lightness in the upper left corner. An escape for the soul, beautiful. I like your two interpretations, and the color accents are great! Beautiful, Shelly! Don't you love the way this pattern lends itself to variations - not only within the pattern, but also with various sizes. I agree with everything already said; about the only thing I could add is I love the colors; wonderful tile. I am always impressed by the diversity in a zantangle. Really great work. Like what you did with this tangle. Lovely work as always Shelly. I'm so impressed with how people have found so many different ways of drawing this tangle - I could only think of one! So much to explore in this one tile! I am always intrigued and impressed with your work, Shelly. Love it, great rythm and movement. Your touch of color is perfect! Really like your interpretation! Lovely! Love the variations you show using this tangle! This is just really cool! It is so interesting to see all the different interpretations of this tangle pattern. Lovely variations. 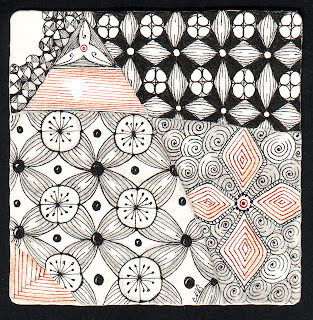 Always love your work Shelly--beautiful piece and love how you played with the pattern! Outstanding variations! I so enjoy your intermingling of sepia and black! Lovely. I'm rather taken by the possibilities for variations of this tangle.